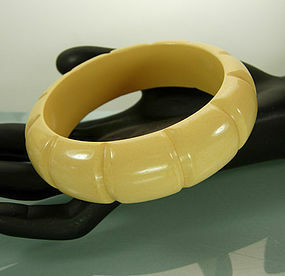 Beautiful creamy palest yellow ivory Bakelite bangle carved in a stylized bamboo form. Circa 1960. Tests positive for Bakelite. Super to wear alone or stack with other bangles. 7/8 inch wide, 7/16 inch thick, and 2 1/2 inches inside diameter. Excellent condition. There are two scratches (shown in photo) which will not polish off but they are not noticeable at a short distance. Photos enlarged to show detail. Display form is lifesize.